When we talk to our clients about social media, many see it as a necessary evil. Something they need to do because their competitors have profiles, or perhaps to meet customer expectations of having a presence on certain platforms such as Facebook or Twitter. We understand the hesitance for many businesses to create and update these profiles, businesses are busy enough without having to worry about posting status updates, tweeting or pinning. However, approached in the correct way, social media can be a fantastic source of customer engagement and revenue for businesses that are willing to devote the time to these platforms. Online ecommerce platform Shopify, which enables users to create online stores, recently released some figures related to social media conversion statistics on it’s stores. They estimate that 37 million social media visits to their stores led to 529,000 orders. Whilst this may seem like quite a low conversion rate, 1.85% for Facebook referrals for example, the average order from that platform was $55.00. If you can drive an additional 40 orders per year via social media, that otherwise mightn’t have visited your store, that would amount to over $2,000 in sales. Not everyone runs an online store of course, and the direct impact of social media on a non-ecommerce business is harder to measure your ROI (return on investment). This is another response that we hear frequently, ‘how will I know what I am doing on social media is actually benefiting my business?’. To highlight these benefits, we want to discuss how certain brands are using specific platforms to engage customers and keep them at the forefront of their minds. 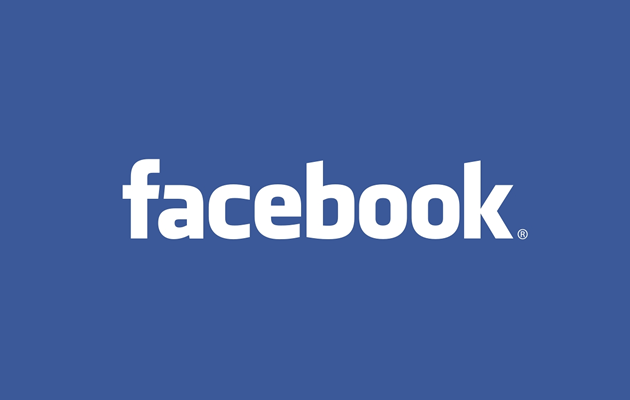 The first article in this series will concentrate on the most popular platform, Facebook. At the end of January 2014, it is estimated that 1.23 billion users were active on the website each month. 945 million of this total were identified as mobile users, meaning that a lot of people are using the platform on the go and away from their desktop computers. Couple this total with the fact that users checking their Facebook feed on average 14 times per day and the potential to engage with customers is massive. 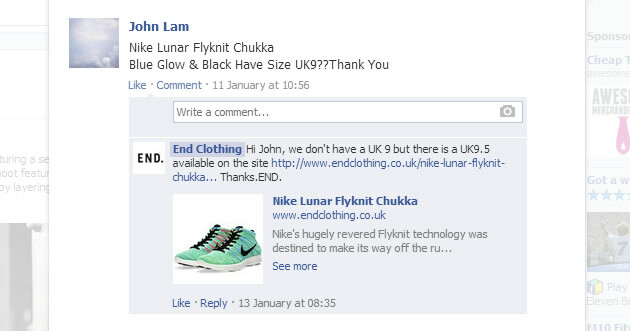 Lets look at an example of a non-ecommerce business using Facebook effectively. Woods Coffee is a family owned coffee shop with 12 locations in and around the Washington DC area in the United States, and was established in 2002. The business has managed to attract over 15,000 likes on their Facebook page through a clever mixture of content such as local / product images, reward schemes and customer engagement through interaction. One idea in particular, ‘where does your woods card go?’, encourages customers to take a photo of the Woods loyalty card in interesting places. So far, this has resulted in users uploading pictures of themselves holding a branded card in front of the Statue of Liberty, the Sydney Opera House and the Tower of London. As well as promoting activity on the Woods Coffee Facebook page itself, this will also be shared on the customers’ pages and their friends’ feeds etc. This will result in free promotion for the business, and Facebook users will be more aware of the brand as a result. Looking a little closer to home, another example of great user engagement with Facebook is a men’s clothing store. End Clothing are based in Newcastle upon Tyne city centre, but are known across the world as being one of the leading suppliers of streetwear and high-end sportswear. Whilst one of the goals of their Facebook page is to drive sales, they also uses the platform to engage customers through the use of lookbooks, information on latest releases and as a way to supply quick and thorough customer service. Using Facebook to support customer service is another advantage of the platform, as users do not have to leave their feed to receive answers to queries. They can be viewing friends pictures and updates, and then receive a reply to an answer within the same feed. Whilst that may not seem like a massive benefit, it allows users to stay within the same platform to achieve their goals. 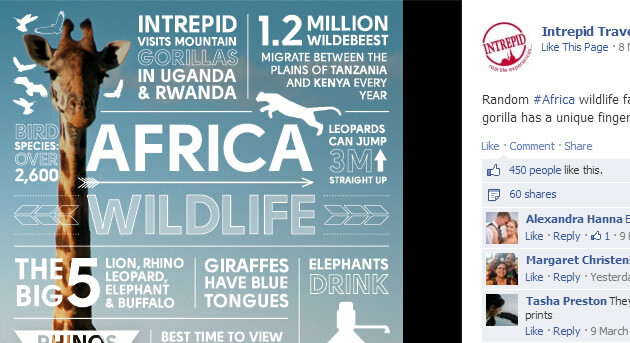 A good example of a Facebook page using imagery to promote their business is Intrepid Travel. The page is regularly updated with great imagery of holiday destinations and interesting infographics, most of which promote the trips to these locations. Images tend to generate over 50% more likes than the average status update, and Intrepid are reaping the rewards for sharing interesting and relevant imagery. The pages we have discussed are great examples of businesses not just using their Facebook profile to simply broadcast information. They are inviting users to participate in conversations, to become part of communities and are providing useful and relevant content. Not all of the users who visit, or even like, your Facebook page are going to become customers. However, if you can begin converting a small percentage of these users into customers then the time and effort you put into creating and maintaining your page will begin to repay itself. In our next article in this series, we will be discussing Twitter and how that platform can be invaluable to swift customer service. You can read more about the social media services that Union Room provide by visiting our services page.